These days it’s a pretty fair assumption that just about anything that exists is covered (in some kind of way) on Wikipedia. I am here to tell you that this is simply not true. Since I’ve landed in Moldova, I’ve discovered something that should have not only its own Wikipedia page but its own fan site selling merchandise like T-shirts and hats. Alas, it has neither. But to tell you this story, I’ve got to tell you a different one first. Many, many years ago, when the moon rose clear and full and the buffalo roamed the plains in large herds, I got suckered into taking a trip with my girlfriend’s father to southern New Jersey. Although the man was of Irish descent (and hyperbolically proud of it), in every other way he was identical to a character on the TV show The Sopranos, or just about every other native of New Jersey, in his sincere but utterly incorrect belief that everything from New Jersey was “better”. What I saw with my own eyes was dilapidated, squalid towns full of row houses all perched on the outskirts of Superfund industrial wastelands. What my girlfriend’s father saw was the “best pizza in the world”, which turned out to be bland slices of grease, the “best sandwiches in the world”, fried strips of meat and artificial cheese, and the “friendliest people in the world” who were all universally hyper-Catholic, engaging in weird rituals involving statues and burnt offerings. So when my girlfriend’s father exhorted me to join him for a three-hour ride through this blighted landscape to get the “best rootbeer in the world”, it is no exaggeration to say that I was highly skeptical. There is an old rule of thumb which says that if you are European, even British, then you won’t like root beer, but if you’re American you will (probably) love it. Originally a non-alcoholic drink made from the roots of the sassafras plant, it is today a niche soft drink flavored solely from artificial chemicals, which usually gives it a distinct (and quite unpalatable, especially to European tastes) and somewhat metallic aftertaste. Before that trip to New Jersey, I wouldn’t have been bothered to cross a room to drink a root beer and now I found myself bundled into a crowded car for a lengthy drive to drink one. Our destination was an A&W restaurant, which further dismayed me because A&W already bottles root beer nationwide and I’d drunk many of their products before without being impressed in the slightest. But my girlfriend’s father insisted that only by drinking “fresh” root beer at the source would I truly be able to experience the ambrosia of the gods. My ex-girlfriend’s father passed away many years ago. He was a bombastic, crude man, often giving in to fits of rage when he didn’t get his way. He was superstitious and arrogant, slightly racist and the least subtle individual I have ever met. But I do give him credit for one thing – the root beer that I drank that night was divine. It was creamy. It was smooth. And it was the most delicious sweet drink that I have ever tasted in my life. As I wrote about recently, I’ve noticed a lot of foodstuffs and restaurants here in Moldova that come from the Republic of Georgia. I know a lot of objective facts about the country, such as their “membership” in the Unrecognized Five (a part of their territory is an “unrecognized” country that acts and conducts itself as if it were a country) as well as their curious (and original) alphabet, but I’ve never been to Georgia and I have no subjective knowledge of anything Georgian. 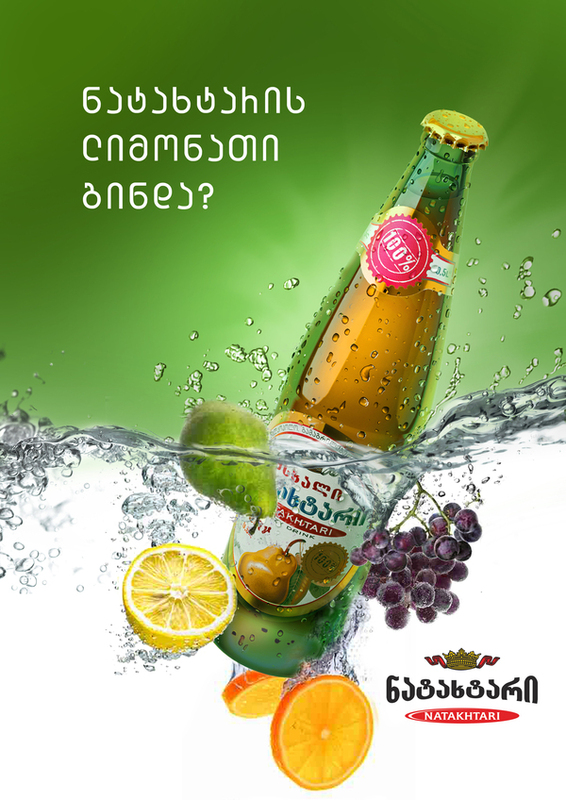 Since 2005, Natakhtari Lemonade is on Georgian Market. It gained great approval and love in customers and is one of the most popular fresh drinks in Georgia. Lemonade is a traditional product, that is unchangeable attribute of Georgian table (sufra). Natakhtari Lemonade is a tasty fresh drink, produced by the best water, that gives filing of childish happiness and being carefree. Natakhtari Lemonade is fresh, stable and unchangeable high quality Georgian brand. Natakhtari lemonade has reached other markets (not only Georgia) and since 2005 it is being exported in several countries. Export is stable in 20 countries, they are: Armenia, Azerbaijan, Belorussia, Cyprus, Czech Republic, Germany, Greece, Israel, Kazakhstan, Kyrgyzstan, Latvia, Moldova, Poland, Russia, Slovakia, Spain, Tajikistan, Turkmenistan, Ukraine, USA. As you can tell by the broken English, the company is not that good at explaining their product, so I will. First of all, it’s called “lemonade” but they don’t make a lemon-flavored drink. It is however, a soft drink (meaning no alcohol), which comes in some interesting flavors, including tarragon (which I haven’t tried yet) and “berberis”, which is another way to say burberry. If you’re thinking of Burberry as a maker of plaid clothing and accessories, now you know that it is named after an actual plant. One of these Natakhtari “lemonades” is simply labeled as “cream”, and it is the reason I am writing this entire post. It is the most delicious cream soda I have ever tasted, bar none. It isn’t related to root beer, but it has a similar “finish”. It is sweet, and yes, creamy, and yet goes down incredibly smooth with no artificial or chemical aftertaste. I don’t even really like soft drinks – I prefer (black) coffee and water for most occasions. When I drink tea it’s usually unsweetened as well. But this cream “lemonade” is ambrosia. It is unbelievably good, so much so that I have to ration myself to one bottle per trip to the supermarket just so I don’t become addicted to the stuff. And the cost? Well, I’m buying it here in Moldova as an imported product and I’m still paying only about the equivalent of 1 US dollar, which I imagine is far cheaper than the high-fructose corn syrup crap that Americans guzzle down on a daily basis. Natatkhtari is also sold by the half liter (500ml), so you’re getting a lot of drink for a low price. Best of all, like all proper soft drinks, Natakhtari comes in a glass bottle. There is just something deeply satisfying about drinking a cold drink out of a glass bottle that is infinitely more pleasing than a plastic bottle. According to Natakhtari’s website, you can find their “lemonade” on sale in America as well as various European countries (although not Romania). If you manage to see this on your local supermarket’s shelf, I highly recommend you give it a try. For for the first time in my entire life, I can honestly say that marketing ad copy is not exaggerated – every time I drink a Natakhtari I really do have a feeling of childish happiness! To my ex-girlfriend’s father, wherever he is in the Great Beyond, I thank you for dragging my stubborn teenage self across the wastelands of New Jersey for that root beer. I just hope that wherever you are, they’re serving up Natakhtari cream soda as well.